Hunting is a great pastime, but it’s extremely important that you protect yourself when you’re out in the wild. Having a reliable form of communication is one of the best forms of protection when you’re out hunting. But, what happens when you’re in a remote area and there’s limited or no access to cellular service? You’re cell phone is rendered useless, that’s what happens! That’s why ever hunter should invest in a two-way radio; more specifically, a handheld two-way radio. Now, let’s take a closer look at each unit. Below, we offer a detailed overview of each hunting two-way radio. Once you’ve decided which option best suits your needs, click on the yellow link to find the best prices currently available on Amazon. The first option on our list of the best hunting two-way radios is the Backcountry Access BC Link Radio System. This long-range two-way radio has been on the market since 2014 and it’s just as popular now as it was when it was first released. 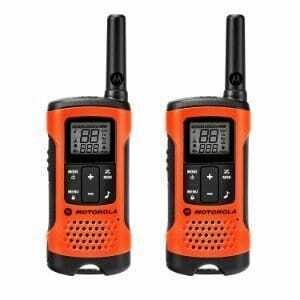 What makes the Backcountry Access BC Link radio long-range walkie talkie so special? Simply: it’s because it boasts all of the necessary features that a hunting two-way radio should have; plus, some convenient extras. For example, you can put the base unit in your backpack and clip the microphone onto the shoulder strap and enjoy hands-free use. The microphone is outfitted with easy to use controls that can even be used when you’re wearing a pair of thick hunting gloves. It’s powered by a rechargeable lithium ion battery, which is built right into the unit; to charge it, all you need to do is plug into a USB port or a wall adapter, both of which come with the device. When it’s fully charged, the battery can last for several days, and it only takes a few hours to charge back up to full power. 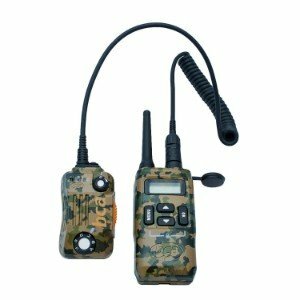 This unit is fully compatible with 22 FRS radio and GMRS channels; plus, it has a total of 121 sub-channels, so you’ll have no trouble connecting and keeping your conversations private. Its waterproof to IP56 standards, too, so you’ll have peace of mind if rain moves in. Based on the reviews that we read, it seems like most hunters are very pleased with this device; they love how easy it is to use, and the range that it offers. Final Verdict: The Backcountry Access Link BC Link Radio system was designed with hunters in mind. It’s easy to use, has decent range, offers plenty of channel combinations, and gets good reception. If you’re looking for a waterproof two-way radio that also offers long range communication, the Motorola MS355R FRS Waterproof Two-Way radio is an excellent choice. It is compliant with IP-67 standards, which means that It can withstand being submersed for as long as 30 minutes in water that is up to 1 meter deep. With that type of waterproofing, you can be sure that it will withstand even the heaviest downpours. This radio is more than just waterproof; it also offers incredible range. It comes with two units that can communicate up to 35 miles apart (in open areas), which means that you and your hunting buddies can track prey and keep tabs on each other from pretty far distances. It also comes with a two-way radio headset and earpiece, so you can private, hands-free communication. The compact, hourglass design fits comfortably in the hand, and the non-slip ridges let you keep a good grip. It’s also a weather radio, as it features seven NOAA channels, which means you can stay on top of the latest weather updates. According to the reviews that we read, most users are very pleased with these two-way hunting radios. They say that It’s durable, easy to use, and offers great range. Final Verdict: Overall, we were very impressed with the Motorola MS355R FRS Waterproof Two-Way Radio. It’s fully waterproof, offers great reception over long distances, receives weather alerts, and is very easy to use. If you’re on the market for a hunting two-way radio that will give you great privacy, easy connectivity, and can be used as an emergency radio, then the Midland GXT1050VP4 50 Channel GMRS Two-Way Radio is a great option. It features 50 General Mobile Radio Service channels, as well as 142 CTCSS/DCS privacy codes, for a total of 3,124 channels! How’s that for privacy? Privacy isn’t all that this radio offers; it also has a range of up to 36 miles, which means that you can stay in touch over pretty far distances. The NOAA weather scan and alert feature automatically scans through 10 weather band channels and connects to the strongest one so that you can receive severe weather updates and alerts. If there’s a risk of a severe storm, an alarm will sound so that you can make appropriate arrangements. Another notable feature is the SOS siren. If you’re in distress and need help, just push the button and the device will emit a loud tone so you can be easily located. This two-way hunting handheld radio also comes with boom mic headsets, belt clips, a 120 volt desktop charger, an AC and a DC adapter, and an easy to read owner’s manual. Final Verdict: The Midland GXT1050VPR4 50 Channel GMRS Two-Way Radio offers long-range, private, waterproof communication. It also features weather alerts and a range of other features that will increase your safety when you’re out in the woods or fields. The Motorola Talkabout T265 Rechargeable Two-Way Radio offers great privacy, great range, and all of the features you could want or need to stay safe and connected when you’re hunting. It offers 22 channels and 121 privacy channels, giving you a total of 2,662 combinations to connect to. It comes with two units, and they have a range of up to 25 miles in unobstructed areas. With VOX and headsets, you can enjoy easy, hands-free communication, which means that you don’t have to fumble with the device and can keep your hands on the task you’re working on. With a total of 11 weather channels, you’ll be able to receive real-time weather updates; seven of these channels are NOAA and they offer alerts that will notify you if severe weather is in the forecast. The LCD screen and backlit display is easy to see in all types of light. There’s a key pad lock that prevents accidental channel changes. You can also set the call tone to one that you prefer, as there are a total of 20 different call tones to use from. According to the reviews that we read, it seems like most people who have used this hunting two-way radio are very pleased with it. They like that it’s easy to use and are happy with all of the features. Final Verdict: The Motorola Talkabout T265 Rechargeable Two-Way Radio offers all of the features that you could want or need in a hunting walkie talkie. It’s easy to use, features weather alerts, has a great range, and offers plenty of channel options for privacy. 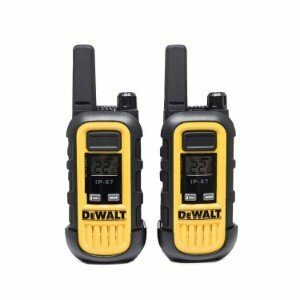 Last up on our list of the best hunting two-way radios is theDeWALT DXFRS300 Heavy Duty Business Walkie Talkies. DeWALT is a highly reputable manufacturer of a variety of communication devices, including CB radios and ham radios, so you can have confidence knowing that you are purchasing a highly reliable, durable product. Though it’s advertised as a business two-way radio, it’s extremely rugged and offers all of the necessary features, so it can certainly be used for hunting. It has the ability to transmit and receive radio signals over as much as 250,000 square feet, which is a pretty large range, so you can your team can stay connected in expansive areas. There are a total of 22 preset channels, and each one is preset with a privacy code, so there’s minimal amount of interference. In terms of durability, you can’t beat this DeWalt two-way radio; it can handle the shock from falls that are as high as 2 meters, and it can also be immersed in up to 1 meter of water for as long as 30 minutes; plus, it’s dustproof. With such durability, you’ll have great peace of mind. Thanks to voice activated transmission, you can keep your hands free for whatever task you’re working on. It has a power save mode, too, which automatically turns on when there haven’t been transmission for 10 seconds to conserve power. The LCD screen is brightly lit and easy to read, so you’ll have no trouble seeing it in any type of light. Final Verdict: The DeWALT DXFRS300 Heavy Duty Business Walkie Talkies may say that they’re for business use, but they can certainly be used for hunting. They are very durable, and they offer long range, private communication so you can stay connected with your hunting crew. A hunting two-way radio is exactly like a standard handheld two-way radio or a walkie talkie, but it’s also outfitted with features that are geared toward hunting. These features may include silent operation to avoid scaring off prey, camo coloring, a waterproof design, and long range communication. It’s an excellent way to stay connected when you’re out in the woods or on a field, or when you’re hunting in any other remote area where cellular connectivity may be limited or unavailable. The range refers to how far away the device can connect to and communicate with other two-way radios. Generally speaking, the longer the range, the better. Weather alerts. You never know when a storm is going to pop up. With weather alerts, you’ll be able to stay updated with the latest forecast so you can take cover if hazardous weather is on its way. Voice activation. 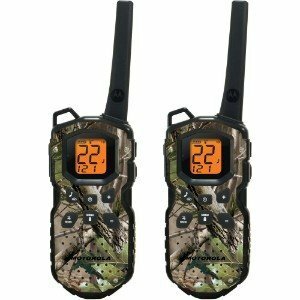 When you’re hunting, the last thing you want to do is fumble with a walkie talkie. Voice activation allows you to use your two-way radio without your hands so you can concentrate on whatever you’re doing. A highly durable device is recommended, as there are a lot of elements that you can come into contact with when you’re hunting. A waterproof, dust proof, and shock resistant radio is definitely a worthwhile investment. A two-way radio is an excellent way to stay connected and keep yourself safe when you’re hunting. Make sure that you choose a device that gets decent range, is durable, and offers hands-free operation, at the very least. Tall of the hunting two-way radios featured in our review are exceptionally durable, offer all of the basic features that you could need – plus some additional ones. 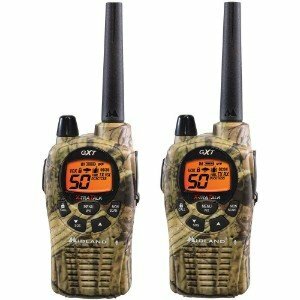 Whatever your needs may be, you can be sure that one of the walkie talkies above will suit your needs and make your hunting excursions all the more enjoyable.